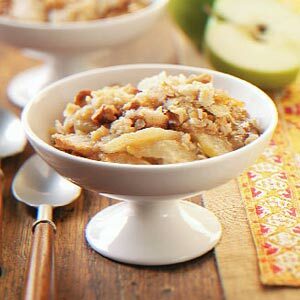 Caramel and apples, topped with a oat crumble. Serve with vanilla ice cream, or a drizzle of whipping cream. In a bowl, combine the flour, sugar, cinnamon and nutmeg. In another bowl, toss apples with orange juice. Add cinnamon mixture and mix. Spread into a greased 13-in. x 9-in. baking dish. Drizzle caramel topping over apple mixture. For topping, combine sugar and flour in a small bowl; cut in butter until crumbly. Add oats and walnuts; sprinkle over apples. Bake, uncovered, at 350° for 45-50 minutes or until apples are tender. Yield: 16-20 servings.